This is what Kaya yells out about every 10 yards when we are driving down the road. She simply cannot pass a field of dandelions without trying to make us stop so she can go pick them. She loves those flowers so much, and we take the back roads to school - there are a lot of un-mowed lawns back there, so she yells it out a lot. Today, even though we were rushing home from work for our first practice game, I stopped the car. She could not believe it. She said "Do I really get to get out?" She was so excited. And I got the best pictures and she had the best time. I am so glad I stopped the car! I love that top image - it makes me think my mom is smiling down on her from Heaven as she happily picks those flowers. the MYO party was a BIG hit! The girls loved it. Neil, Matt and I feel like we have been hit by a truck, but I think that is a sign of a really cool party. They made their own Pizza, Sundaes, Music CDs (and they ALL sang which was incredible) and Purses. They Loved all of it. It was so cool having them all be so excited to sew and sing. The girls were just fun to be around. They seemed so grown up this year. And it was so much fun. Here are just a few of the 250 pictures I took yesterday. Kaya came RUNNING into the house this weekend telling me that I had to come and see "the best thing EVER!" She was out of breath from running to get me. She ran me all the way back to this hill behind our house that leads into a retention area.... she was jumping for joy because she had searched the yard for dandelions and only found a few.... then, Daddy showed her that the unmowed hill was FULL of them. She was soooo excited. She said "Isn't this the most beutiful hill ever?" I love how she sees a hill of weeds as something of amazing beauty. I wish she would always feel that way. She needed more flowers because her and her sister were making a project on the driveway. I hated that we had to move it to get the cars into the garage. At least I have the pictures. Scrapbooking makes me very very happy! How did my baby get to be eight years old??? Man, time sure does fly. 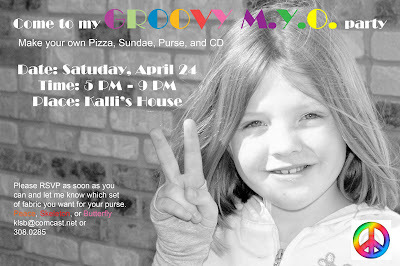 Made invitations for her GROOVY M.Y. O. (make your own) party this weekend. We are making pizza, sundaes, purses and a CD. Neil will have them sing and pull it onto a CD for them to take home. I have a LOT of work to do and the party just got moved UP.... but it should be fun for sure. My Library of Memories Albums are labeled! Ohhhhhh, I know I am WAY more excited about this than I should be, but my heart RACES when I walk by this shelf. I got the shelf out of the attic and got the spines all labeled today. I love them. I MEAN I LOVE THEM! I am so happy with how simple they were and how consistent they look. I love the photos on the circle tags. I love all of it. THIS is just cool.